Steve James, 4 days before archery opener. Thats an amizing bull. Bigger than any I saw. you should post a picture of your bull or if you have where is it? Yeah Mr Fish Lake, I bet you are all talk. Anyone can get on here and say that they shot a trophy. Let’s see some proof of your 390 bull. I bet you haven’t even seen a 390 bull, let alone taken one. hey i am a country boy and have shot a 375 bull down montana way. it was a great hunt with my dad. I am 16 and haven’t shot a bigger bull yet. Hey I would love to see that picture of your supposed 390 class bull elk, I am from one of the premier states to hunt elk and its very rare to shoot a bull elk in that class range. 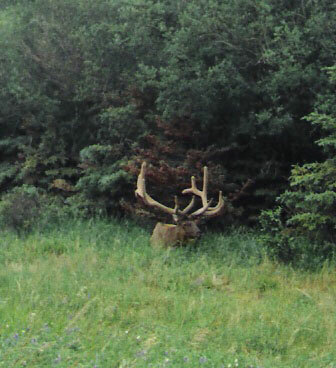 I have killed two bull elk and I missed a monster bull that maybe pushed 350 and he was about the same size of this one. In fact In fact I think he is bigger than the one I missed. hey my dad and uncle got bulls over 400 so I dont know why you are saying a 390 bull is hard to find. just got my first bull not to big but good enough for me. its a four by five. came out of washington state. who cares who shot what. 200 to 425 are all great elk. the only ones missing out are the guys who haven’t gotten one yet.